Punch or cut mini hearts out of white card-stock. You can line the hearts up simulating the finished garland to get an idea of how many hearts you will want to punch out (or cut). Lay hearts out on waxed paper and get to watercoloring each heart. Have fun and play around. We liked the look of layering the watercolors. Pink watercolored over yellow and red watercolored over orange, for example. You can also play around with brush techniques for different effects. Once you've finished painting all the hearts, flip them over and watercolor the other side. Allow hearts to dry for a few minutes. This doesn't take long.....I guess it may take longer if you live in Hawaii. You jerk. Before you sew the hearts together, pull your top thread and bobbin thread so you have excess thread for ease when you hang your finished garland. You can use any color of thread that you prefer to sew the garland together. I used a pink thread that I had on hand and I loved the way it coordinated with the hearts. 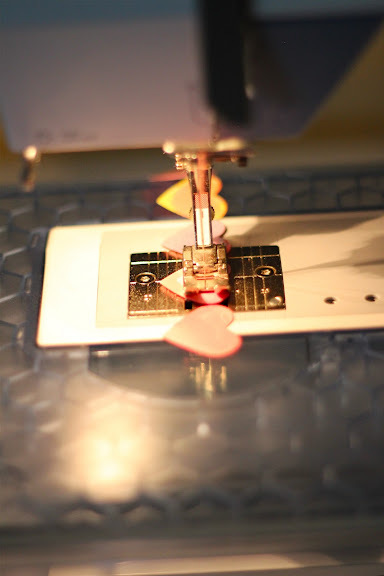 Sew hearts in a continuous line to make up the garland. Make sure you back-stich the beginning and end of your garland! All done and ready to hang! So cute! That's a great idea. We'll have to give it a try. I know my kids would love it too! Thanks Bri! Dude, you're blowing me away - I love it! And what a fun little project with Lil. Sarah- Thanks for you comment! I hope you guys enjoy it! Haley- You blow me away all the time. I just love and admire you so much. Thanks for all your comments. Totally appreciate it. Cute! I love the simplicity of it hanging on your mirror. Thanks, Brit! I liked the simplicity too.